Linda Austin of Artland gave a fascinating and highly informative talk and demo of the product range from Golden Artist Colours. Their primary product range are acrylic paints although members also delighted in the watercolours in the invitation to try out the Golden products after the talk. Wide range of Golden acrylics as well as watercolours. Linda showed us many examples of how different products can be used. Our Chairman, Ian Jay, thanking Linda for a highly informative and enjoyable presentation. Next Meeting: Tuesday 23 April 2019 at 7.30 pm. At the Alphen Hall Constantia. Karin Davel - opening minds to new possibilities: an interactive event. 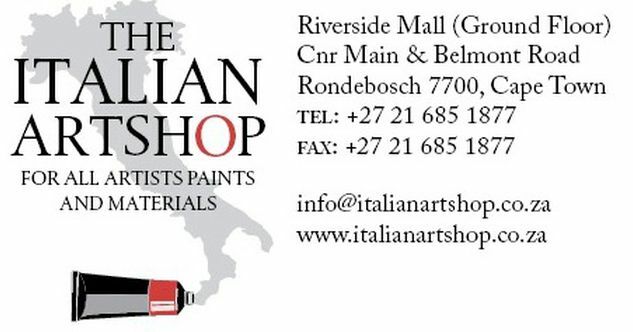 SPONSOR OF OUR PAINTING COMPETITION - 021 794 8995 . All images on this website remain the property of each and every individual artist . Simple theme. Theme images by gaffera. Powered by Blogger.